Blue Bay Grand Esmeralda | Playa del Carmen - BIG Savings! The BlueBay Grand Esmeralda is a 5* family-friendly all-inclusive hotel just 15 minutes away from the heart of Playa del Carmen. Be encapsulated by lush Mayan jungle, mangroves, and outstanding views of the Caribbean sea at The BlueBay Grand Esmeralda. The hotel boasts a private beach, delicious food, and a full spa. It's the epitome of paradisiacal bliss! 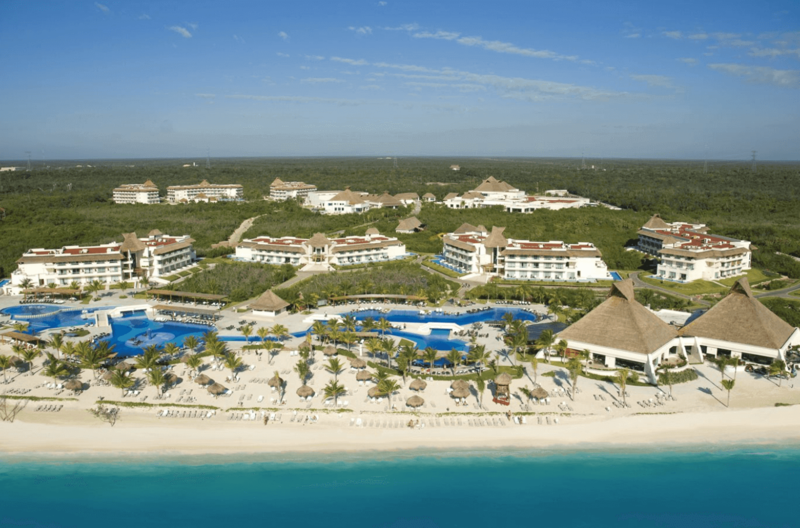 Along with many other awards for customer service, facilities, and commitment to ecology, The BlueBay Grand Esmeralda was reviewed as the best all-inclusive hotel in the Riviera Maya by Expedia in 2010. For exclusive deals - call us! Rooms at the BlueBay Grand Esmeralda are both elegant and spacious. Categories are split up into doubles and suites, both of which offer breathtaking views of the sea, the lush gardens, or both. All of the rooms feature a balcony or terrace and come with air-conditioning, en-suite bathrooms, TV, internet access, coffee machines and more. If you decide to upgrade your room to a suite at the BlueBay Grand Esmeralda you can enjoy the luxury of having a king size bed, full minibar, a living/dining room area, and an extra sofa bed. Jacuzzi and Swim-Up suites are also available and come with a hot tub and access to a private pool. Tantalise your taste buds at 6 a la carte restaurants where you can enjoy world cuisine and great cocktails. The highly trained chefs serve up some of the finest French, Italian, Mexican, and Oriental food in the Riviera Maya. There are also 3 open buffets where you can enjoy breakfast (7 am to 11 am), lunch (12 pm to 3.30 pm) and dinner (available from 6 pm to 10 pm). Snacks and drinks are available throughout the day and the sports bar is open around the clock. A la carte restaurant with Oriental cuisine. Indulge your mind, body, and spirit at the extensive BlueBay Spa (approx 2.5000 m2) open every day from 9.00 am - 7.00 pm. Rejuvenate with an aromatherapy massage, reflexology treatments, manicures, pedicures, and more! The extensive range of treatments and services are sure to impress all guests who choose to unwind and relax at the BlueBay Spa. At the BlueBay Grand Esmeralda, there are modern and exclusive facilities to carry out your meetings and events in a personalized way in an appropriate environment, either next to a paradisiacal beach or in a championship golf course. Get fabulous group rates and help to organize your group getaway. Contact us for group bookings. The BlueBay Grand Esmeralda has a dedicated team to help you plan your dream destination wedding. With multiple locations for your ceremony and idyllic scenery, there's no better hotel to celebrate your love for one another. Learn more about having your destination wedding at The BlueBay Grand Esmeralda, contact us for weddings. Giant chess board (next to the pool). Scuba-diving (tours at additional cost). Universal gym (bicycle, stepper, treadmill,...). Mini Club with specialized monitors. Shopping mall with boutiques, newsstand, tobacco shop, etc. Non-motorized water sports: sailing, kayaking, etc. Massages, facials, and body treatments.